Innoweld is specialized and experienced in engineering, fabricating and exchanging effluent chambers of industrial steam reformers within ammonia and hydrogen plants. We provide the full scope of service and support which is needed for a successful and fast execution of such a replacement project. The inliner is mostly fabricated out of Alloy 800H or another austenitic, heat-resistant nickel-iron-chromium solid solution alloy. Its main purpose is to conduct the gas flow and to prevent the refractory from eroding. The gas within the inliner has a temperature around 830°C in this area. The refractory or castable within the effluent chamber can be seen as insulation between the hot inliner and the pressure-resisting shell. It will be individually calculated to check the heat transfer and to prove its suitability for the reformer. 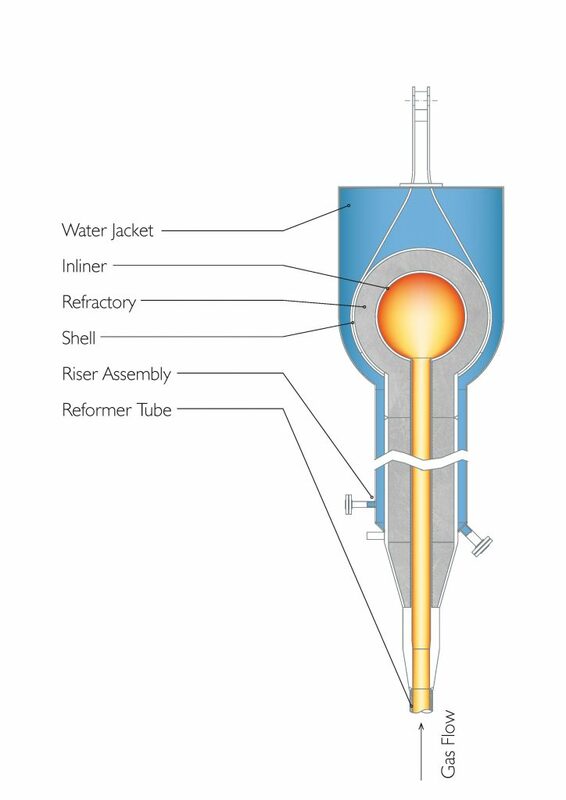 The shell is responsible for resisting the internal pressure of the process gas within the primary reformer of a KBR ammonia and hydrogen plant. It is designed to withstand temperatures of around 300°C and therefore needs protection from the direct gas flow. The water jacket of the effluent chamber is also an important part because it is responsible for cooling the shell and guaranteeing the long-term functionality of the critical outlet system. The riser transition assemblies connect the reformer tubes with the effluent chamber and will be delivered with a centrifugal cast cone on the top which needs to be welded to the reformer tubes by an experienced welder. Inspection: To analyze the conditions of the complete system and to provide you with an external documentation and opinion, we can send our staff to your site within days. Engineering: First of all, we carry out the mechanical engineering including calculating the pressurized and non-pressurized parts and simulating their suitability by FE-Analysis or even CFD Simulation. During the engineering, the creation of the assembly and fabrication drawings is also part of our service. In this phase, we design the parts properly to compensate for the thermal expansion which occurs during the process. Sourcing: Our long-term relationship with high-quality suppliers for the raw materials guarantees that we receive all the parts as soon as possible and with the high quality that we expect. Fabrication: Our experienced staff are specialized in handling the critical materials and installing the refractory. Furthermore, all the important fabrication steps are documented to give a clear overview of the fabrication steps and a provable track record of all the quality control steps within the process. Testing: Our quality control system is proven by ASME, AD2000, KGS and more… We can carry out all the nondestructive testing in-house, have our own laboratory and document the inspections and their results according to the individually developed inspection and test plan. Installation: For the installation of a newly-fabricated effluent chamber we can assist by sending our supervisors to coordinate the installation at site and securing the quality of the installation. Furthermore, our welders and fitters who work with this critical high alloy and high temperature-resistant materials every day can be sent to speed up the installation and to avoid expensive delays or repairs. Due to the fact that the exchange of an effluent chamber is an event that occurs only once in decades, we can support you with our experience and our technical knowledge on every area of the revamping project. We know the state-of-the-art materials, the appropriate testing methods and how the installation can be performed. 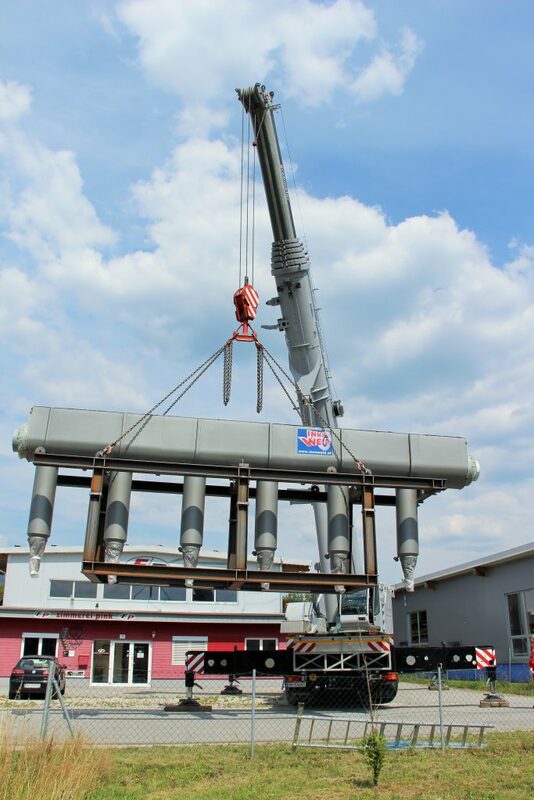 Our individual approach for every project makes sure that the newly-delivered effluent chamber and the exchange is a technical and commercial success for your company. Our sales team is looking forward to your request.